A national company cropping in Pensacola??? No way! 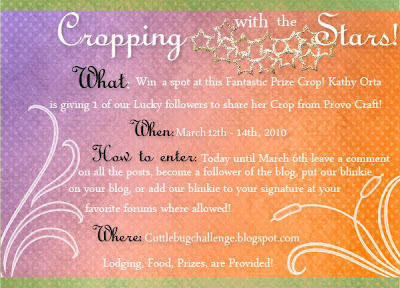 I've entered to win... and hope I do! What a great way to gain some crafty inspiration! Products now available at From Cover 2 Cover! I am pleased to announce that Kits2Remember acrylic, metal and chipboard are now available at From Cover 2 Cover, a new online store owned by K2R enthusiast Julie Wilcox. Julie has been a huge K2R supporter the past two years and has been a great customer! 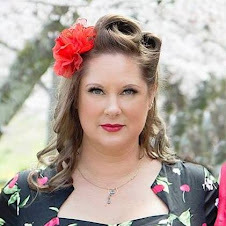 She lives in Southern California, has her own unique style and creative ideas, and is also a paper crafting instructor. From Cover 2 Cover will have these raw materials available for both wholesale and retail, and Julie warmly welcomes all K2R customers to her store. If you live in Southern California, be sure to stop by the From Cover 2 Cover booth during the San Diego Scrapbook Expo the first Friday and Saturday in May. I wish Julie the best of luck in her new venture and hope those of you who have supported Kits2Remember so well will do the same for From Cover 2 Cover! The Cinch ... works on K2R materials! Sad but true. While CHA-Winter in Anaheim, Calif., showcased a number of fun and innovative companies and products, some of the old favorites are closing up shop. While the unique raw materials of Kits2Remember will hopefully be back on the market with a new owner sometime soon, there are a number of manufacturers who aren't so lucky. The latest is Rusty Pickle, who I remember as being a fun and generous company when the SoCal2Provo Bus Tour traveled up to CKU-Provo a year and a half ago (Creating Keepsakes University is another scrappy something that has gone the way of the dodo...). SoCal2Provo Bus "tourist" Stephanie shows off her shopping smile. 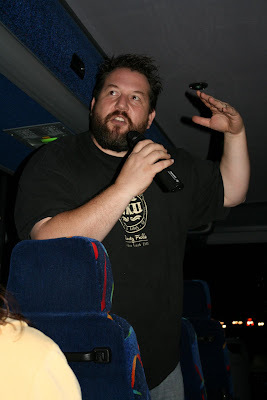 Owner Lance Anderson (below) opened up the RP warehouse at midnight one night exclusively for the bus tourists, riding woth us on the bus and acting as our personal tour guide. This past year has been incredibly tough on Rusty Pickle due to the economic situation. We feel that we can no longer survive as a company; consequently we have decided to close Rusty Pickle. We would like to thank all our customers who have supported Rusty Pickle for the last 7 years. 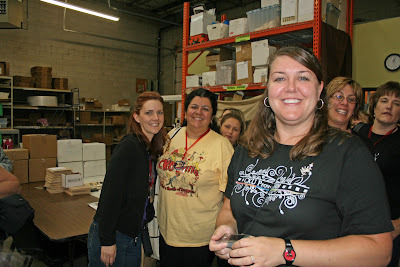 Be a part of scrapbooking history! 10:00am – 6:00pm all day cropping with in and out priviliges. Don’t miss being part of this exciting event! Come be a part of the fun, bring your friends, and crop the day away! Have fun and be sure to take lots of pics! After much debate and indecision, I have decided to get out of the scrapbooking retail and wholesale business. With my move from Southern California to Florida, the downturn in the economy and the needs of my young family, I am just not able to devote the time necessary to manage and promote Kits2Remember the way it needs to be. With that said, Kits2Remember is having one last sale this week – 50 percent off items in almost every product category – no promo code necessary! This sale applies to in-stock items only, and while supplies last. At this time, Kits2Remember products will not be represented at any of the upcoming Scrapbooking expos and shows. Please order now and use your frequent shopper points in conjunction with the sale through Sunday Jan. 10. All items will ship the week of Jan. 10 via USPS. The Kits2Remember online store through Qbaroo will shut down this month; however Kits2Remember.com, as an idea, resource and educational site, will remain live. Kit instructions will continue to be available online. You can also still contact me via email through the web site, as well. Also, if anyone is interested, I am selling one of my cargo trailers, a 2007 5x8-foot enclosed white Wells Cargo trailer. It is located in Irvine, Calif., and will be sold with 16 panels of gridwall, complete with wire baskets, shelving and hooks, cash register, a Zutter DreamKuts, box of buckets, baskets and pails for small items, boxes of plastic grocery store bags, a pink 8 x 8 wire paper rack, a 12 x 12 white paper rack, Ranger paint dabber (4) and Stickles (1) racks and set of rolling drawers. $4,000 for everything. It will also be listed on Craigslist later this week. If anyone is interested in buying the rights to sell the raw materials (acrylic, metal and chipboard) portion of the business, please feel free to contact me – serious inquiries, only, please. These products are unique to the industry and I would hate to see them become completely unavailable. While I still plan to teach classes when I can, simply because I enjoy it, I very much want to focus on the creativity and fun scrapbooking and paper crafting brings to my life. I thank each and every one of you who has been so enthusiastic and supportive during my 2 ½-year adventure. I’ve had a lot of fun, made some wonderful friends and have learned so much! I want to send out a huge thank you to my Expo Krews and the K2R Design Krew; to my parents who were always more than happy to lend a helping hand, and to my husband, Rodney, who has stood with me through the ups and downs this experience has given me. It’s a small Scrap World – I’m sure I’ll see you around!